As I’m writing this post, I’ve recently finished editing a Life Stories podcast featuring Rayya Elias, which we recorded shortly after her memoir Harley Loco came out in paperback. And that reminded me that I’d had this recurring thought about how I could tell you about some earlier episodes of the podcast, and how those books were out in paperback, too, and if you hadn’t read them when they first came out, here was a good opportunity. Well, if you look at the iTunes episode list, you’ll see the podcast has been running for just about two and a half years now, so a lot of those books are in paperback now, and it didn’t seem fair to single out some at the expense of others. So I thought, okay, have any of my early guests come up with a new memoir? One of my first conversations was with Tim Anderson, who’d written Tune In Tokyo about his time as a teacher of conversational English in Japan. 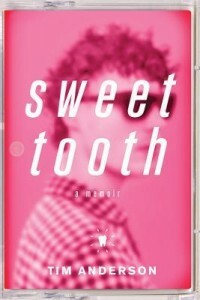 His second memoir, Sweet Tooth, backtracks in time to his North Carolina adolescence, when he was simultaneously realizing that he was gay and developing the first symptoms of diabetes. As in his first book, Tim tells his story with an airy, self-deprecating humor that’s likely to draw you in pretty quickly—and you don’t need to have read Tune In Tokyo to follow along, so you can jump right in.